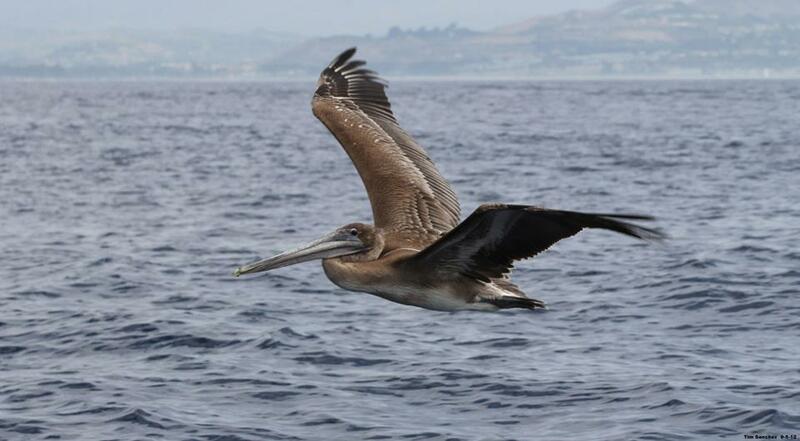 California brown pelicans, the smallest member of the pelican family, can be found from southern British Columbia to southern Baja California. They have short legs with fully webbed toes, a large bulky and oddly proportioned body, long dark bills and a throat pouch that can hold up to 3 gallons of water. It appears awkward when on land but is graceful in flight and in diving from great heights. They feed primarily on surface, schooling fish such as Pacific mackerel, sardines and anchovies. Pelicans use their keen eyesight to spot fish, then catch them by plunge-diving from just few feet above the water to heights of 20 to 60 feet. The power of the dive can stun fish up to 6 feet under the surface allowing the bird to easily capture them. They then point their bills downward to drain the water from the pouch, then tip their heads up to swallow the fish, head first. California brown pelicans were nearly made extinct by the run off of pesticides from agricultural crops, causing the birds’s eggs to be soft-shelled and break when sat upon by the parent. Thanks to the elimination of DDT and other types of dangerous pesticides, the California browns are a remarkable tribute to people’s efforts to save our wildlife friends. Photo courtesy of Tim Sanchez, “Sons and Daughters of Capistrano Beach”, Facebook.